While the rise of the machines still looks like an unreal scenario, there’s been significant progress in artificial intelligence lately. The most popular search engine, Google, is getting closer and closer to the human brain. A decade ago, it could understand only separate words, but today it has a grasp on the user intent. That’s become possible with RankBrain. Launched as an experiment first, this machine learning technology turned into an integral part of Google’s ranking algorithm soon. RankBrain is constantly teaching itself about us. It learns which results we like and which of them don’t match our intent. With such an understanding, Google finds relevant pages, even though they don’t necessarily have the exact wording we type into the search bar. When RankBrain comes across a query never seen before, it can guess at related concepts and returns results based on that guesswork. Let's run a few quick experiments to track Google’s progress in artificial intelligence. Back in the day, Google processed search queries word for word, letter for letter. But is a literal match still the case today? Let’s check it out using "buy a jacket online" as a query. Most search results have the word “jacket” in the plural form. The engine understands that buyers usually look through a wide range of items before making a final choice. That’s why it erased the border between singular and plural noun forms. Obviously, pages optimized for a keyword in the plural are relevant to queries in the singular. And vice versa. It may be too easy for Google to equate singular and plural forms of regular nouns. The only difference between them is an "-s" ending, while the rest of the stem remains the same. Now, let’s experiment with irregular nouns changing their stem in the plural. Here are organic results for "cage for mouse." As you can see, Google can handle more difficult cases when a noun looks like different words in the plural and singular. When writers convey the same message, their wording often differs. Let’s search for a guide on how to install a satellite dish. 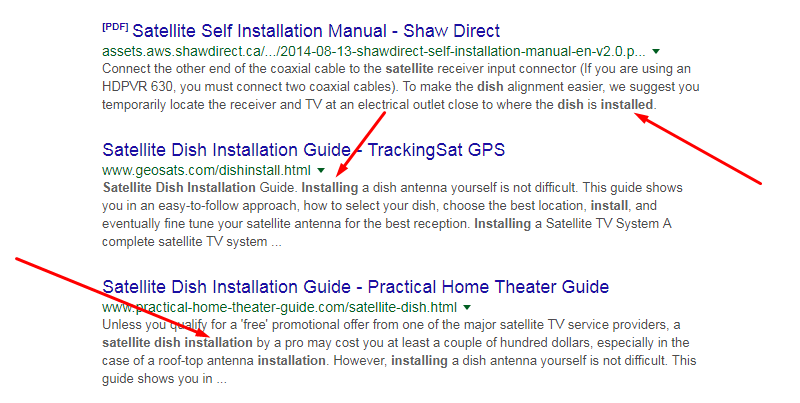 Google returns the following organic results for the query "install satellite dish." Different authors use the word “install” in different forms. Sometimes, it gets "-ing" and "-ed" endings. In other cases, the verb transforms into a noun with an "-ation" suffix. Searchers use words with a similar meaning interchangeably. Let’s say you want to build a site in 2018 with the help of WordPress and a professional template for its design. If you type a query like “top WordPress templates 2018,” here’s what you’ll find. Instead of “templates,” Google returns results with the synonym “themes.” Both keywords mean the same in the context of web design. 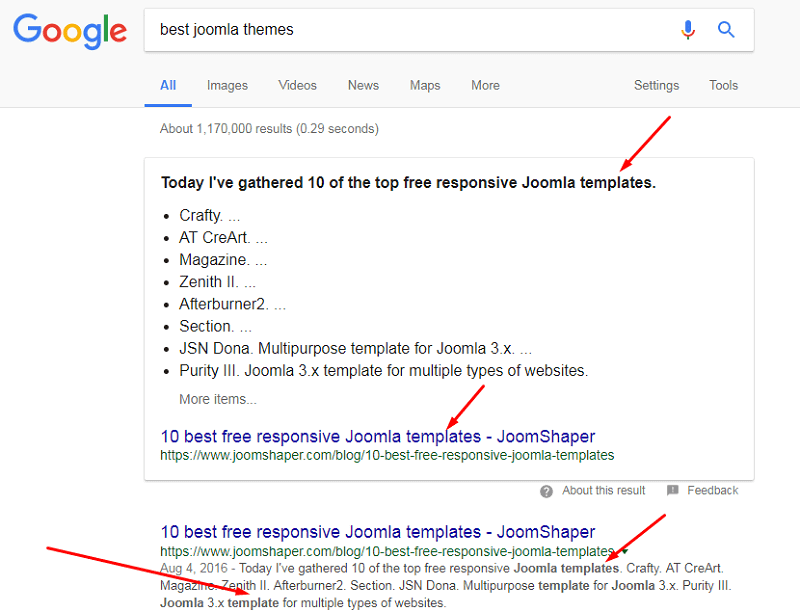 Google knows that the “theme” is more common for WordPress than the “template.” The latter is commonly used for such a content management system as Joomla. Let’s type the “best Joomla themes” into the search bar. 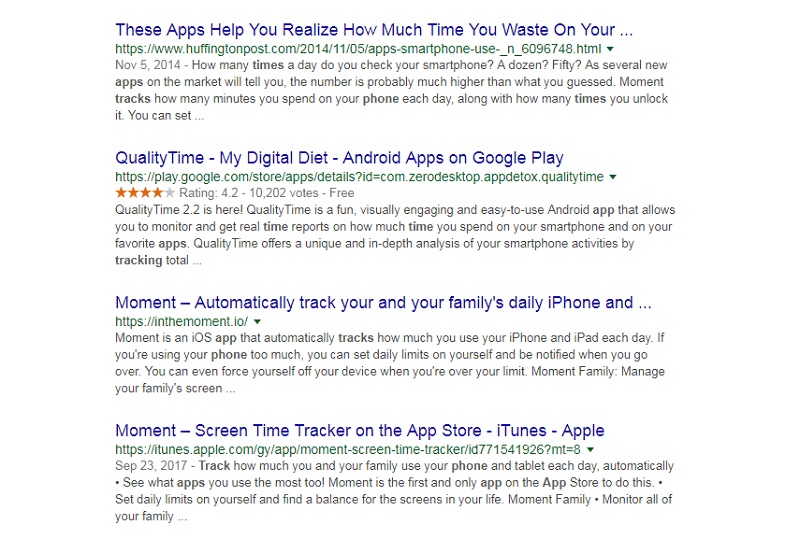 The top result contains the word “theme” neither in the SERP snippet nor in the post itself. But it still ranks #1 in organic results and also above them as a featured snippet. Organic results have a reverse word order. The word “car” starts the phrase in SERP snippets, while in the original query it stands at the end. It means Google cares neither about the word order nor about prepositions or articles. Every Google user has their search preferences. As a rule, long-term users opt for short queries, while newbies find it funny to type full questions. Does the query length make any difference in search results? Let’s check it out using a short phrase, e.g. 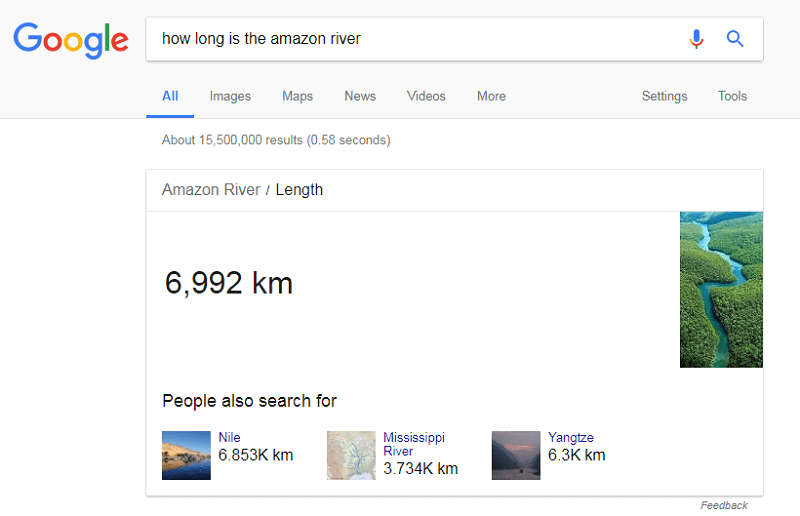 “Amazon river length.” Here’s how SERP looks. As you can see, Google returns pretty much the same results for both queries. The engine understands that any search term is a question. So, there’s no point to differentiate between short phrases and full questions. The main aim of Google is to provide the necessary info ASAP. In the previous experiment, you could see an instant answer without scrolling down to the top ten results. Kudos to the Knowledge Graph for such an opportunity. But the engine has gone much further than that. It can extract the requested info from pages and show it in organic results too. Let’s say you are curious about who judges contestants on America’s Got Talent. Type “America’s got talent judges” into Google, and you’ll see their names right under the title in the SERP snippet. Here’s another interesting finding on Google’s progress in artificial intelligence. 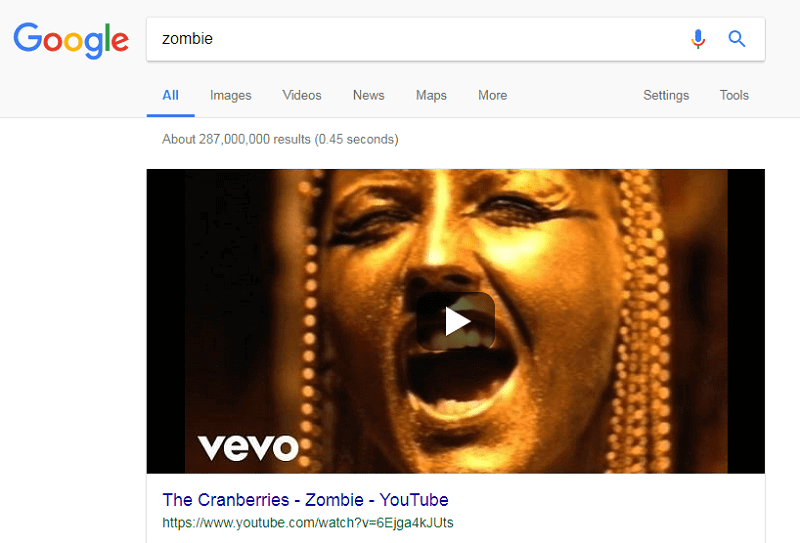 When I wanted to rewatch a video to my favorite song by The Cranberries, I typed one word “zombie” into the search bar. Here’s what I saw. A music video again. 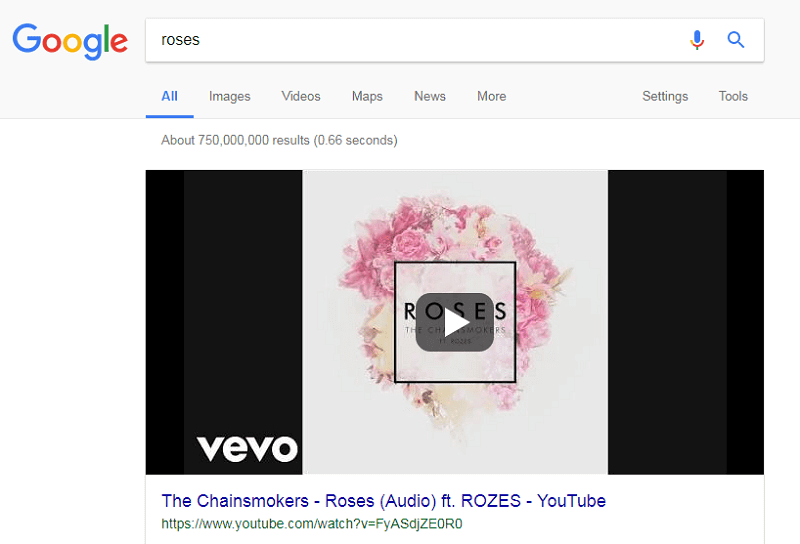 Either Google has a thing for music or the engine understands that it’s the most common thing users want to find. Now, let’s see how these findings can help you optimize your content for Google’s intelligence. When using keyword generators, you will find hundreds of similar keyword ideas. Don’t rush to use them all in your content. Here are the ways to keep your writing clean from keyword stuffing. 1. Treat phrases in the singular and plural as the same keyword. For example, if you find a promising keyword in the singular when reviewing a few products, you can use it in the plural. And vice versa. 2. When possible, use common abbreviations. If your target keyword is “spa salon in LA,” mention the full name of the city for the first time. It will keep readers 100% sure of the place you’re referring to. Then, feel free to use its acronym throughout your copy. The audience will know what LA stands for. In some cases, you don’t have to introduce abbreviations in their full forms, as they are well-known to the target audience. For example, most people know that a DIY guide means a do-it-yourself guide. There’s no need to decipher such obvious things. However, these keywords have an identical level of specificity. So is the search intent behind them. And Google returns quite similar results for both. 4. To keep your copy Google-friendly, keep it human-friendly. If your target keyword is a mishmash of words, you can’t use it as is. You must look like an authoritative resource to keep people coming back to you over and over again. If your content is unreadable and full of grammatical mistakes, you’ll end up in a failure. While the former looks like chaos, the latter sounds natural. If your keyword generator gives you only unreadable suggestions but they are easy to rank for, you can always paraphrase them. Simply reorder words and add prepositions or articles to make the phrase grammatically correct. That’s all. 6. Write in plain language without intricate phrases. They only sound weird and affect the content readability. For uncommon queries, Google returns results written in simple language anyway. You saw this trend in the experiment with WordPress templates and WordPress themes. In other words, write for people, not for keyword-oriented systems. These were just small experiments and conclusions to draw from them. What happens in Google’s brain is a mystery protected by its loyal team. But there’s one thing for sure. Today, the engine is already good at understanding the human intent. Can you imagine how smart it will be in a decade with the rapid progress in artificial intelligence? Feel free to share your suggestions in the comments below, please.